Rancho Santa Margarita, CA – February 2018… Eiki International, Inc. a world leader for over 40 years in projection technology, is pleased to debut the EK-350U Meeting Room projector. This exceptional projector offers 4500 ANSI Lumens brightness and WUXGA resolution, as well as 3 LCD design for excellent image quality and reliability. Of particular note, the EK-350U’s ColorSpark HLD LED projection system lets those in the room see everything that's on the screen in sharp definition with vibrant, clear colors. With its HLD LED technology, the new EK-350U provides a light source life of 25,000 hours for trouble-free reliability. Furthermore, because the EK-350U’s HLD LED technology emits four times the light of current LED technology, the result is stunning visuals, with the screen appearing as much as three times brighter while retaining brilliant color performance. An additional benefit of the projector’s integrated HLD LED technology is its rapid power on and off capability. With a 50,000:1 contrast ratio, Corner Keystone Correction, 360-degree free orientation projection (both vertically and horizontally), Lens Shift functionality, and a Curved Correction and Blending function, Eiki’s EK-350U facilitates flexible installation—making it an ideal choice for even the most challenging rooms. Further, the projector includes convenient 1.09 - 1.78: 1 throw to width manual zoom and focus lens. Connectivity is yet another strength of the new EK-350U. This exceptional projector includes HDBaseT In, HDMI In, VGA In, VGA In, 2 (YPbPr / S-VIDEO), and Composite Video In to accommodate a wealth of sources. There is also a USB port for use as a memory viewer, Audio In (RCA), Audio Out (3.5mm mini jack), an RJ-45 LAN connector, and an RS-232C D-sub connector for control purposes. 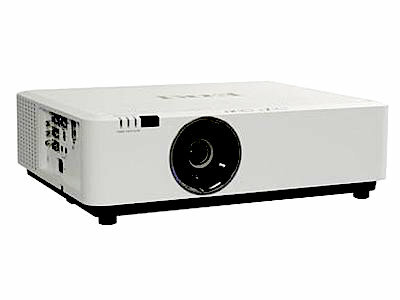 Eiki’s new EK-350U Classroom / Meeting Room projector is shipping now. The EK-350U MSRP is $4,995.00.